Freschard grew up in a farm in French Burgundy. She started organizing shows in the barn when she was about 12 years old. Aged 18 she moved to the big city, Paris, where she baked pies and cakes in a cafe. There, a local musician and regular customer called Andre Herman Dune wrote a few songs for her to sing. She called her first E.P. “Neon Orange”. Homeless in Paris, she saved up just enough money to get herself a ticket to New York. There she found an old electric guitar and started writing her own material. She recorded her second e.p., "Shower Gel", with Mike Gomez on lapsteel guitar. With AHD and G. Lucas Crane she also formed a band called Back Up, and worked on poetical noise music. 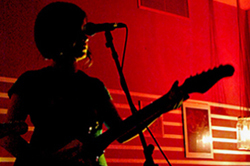 In 2004 she moved to Berlin, where she recorded her first LP, "Alien Duck", with a mix of electronic and acoustic sounds. Her second album, "Click Click", recorded in 2006, features a drummer (Leo Bear Creek), and electric guitars by Stanley Brinks. On her third album, “moonstone”, she plays the drums herself. She works as a sound engineer and records her friends' music. She also has a Calypso cover band with Stanley Brinks, called Kreuzberg Museum.